Is there a distinct Walser architectural style? In Valais the wooden constructions prevail. The brown and often multi-storey houses stand close to each other. For the most part a barn and shed are alongside. The shed is secured against rodents with stone pillars. Traditionally, the buildings are covered with granit slabs. As soon as you leave Simplon southwards stone houses change the landscape. Buildings made of stone can be found where the construction material wood is missing. The architectural style of the residential and farm buildings developed regionally. They change over time and according to municipality and location. There is no “Walser”-house, barn or shed which was taken by the migrants into their new homelands. 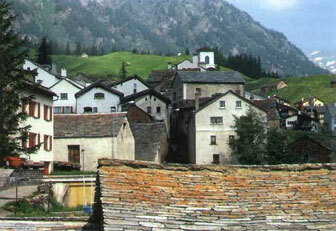 There are similar buildings in the French-speaking Valais, in Upper Tessin or in the Reatoroman canton Graubünden. Architectural styles developed in certain regions that became traditional. For example, there is the Walser house in Tannberg and Mittelberg which developed regionally: the floor plan as well as the architectural style vary only little.